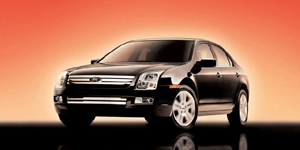 For 2007, the Ford Fusion comes standard with the previously optional side-impact and curtain airbags, while Fusion SE models add fog lights. Sirius satellite radio and DVD navigation are optional, as is a folding front passenger seatback on SE and SEL models. All-wheel-drive is optional on V6 models for 2007. The 2007 Ford Fusion Sedan is powered by a base 2.3-liter Inline-4 with 160 hp. Also available is a 3.0-liter V6 with 221 hp.